How Many Ways Can You Connect To The Internet? 1 How Many Ways Can You Connect To The Internet? 3 Overview Of The Unit Fancy That! is a business selling fancy dress costumes. They want to create a website to advertise their business with a catalogue the customers can look through. They hope in the future to sell their products online. They have asked you to produce a series of reference guides to help them understand the technical work and the security work that needs to be completed. 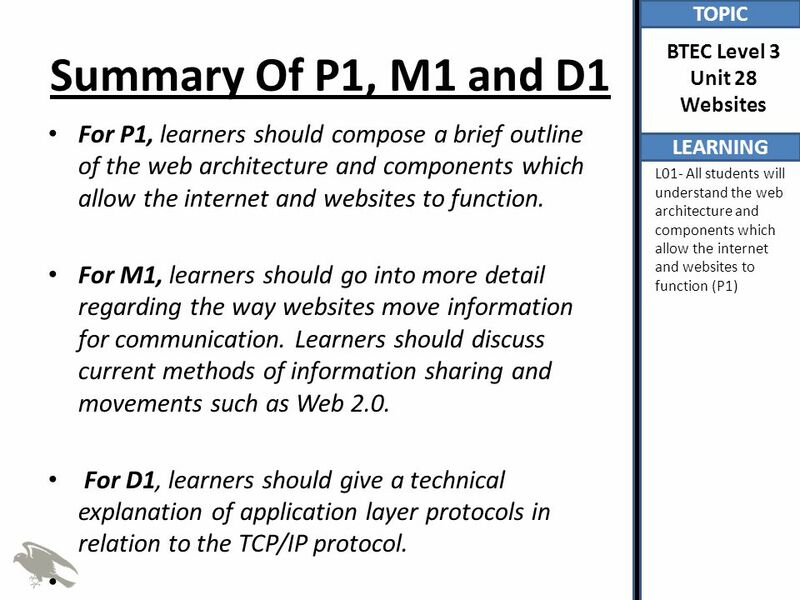 4 Summary Of P1, M1 and D1 For P1, learners should compose a brief outline of the web architecture and components which allow the internet and websites to function. 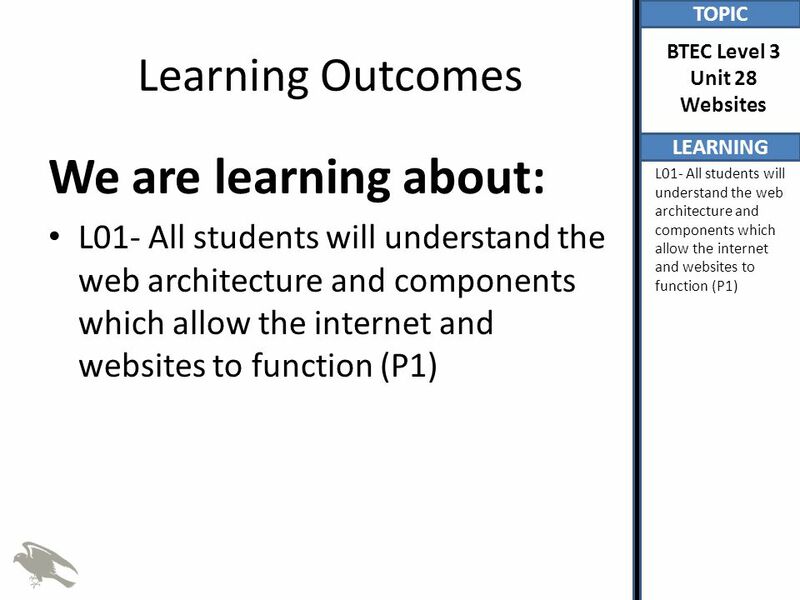 For M1, learners should go into more detail regarding the way websites move information for communication. 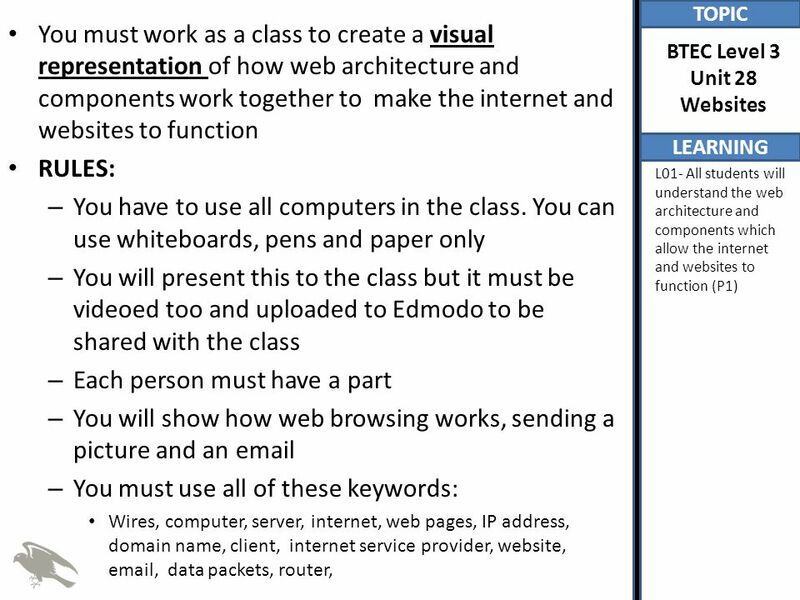 Learners should discuss current methods of information sharing and movements such as Web 2.0. 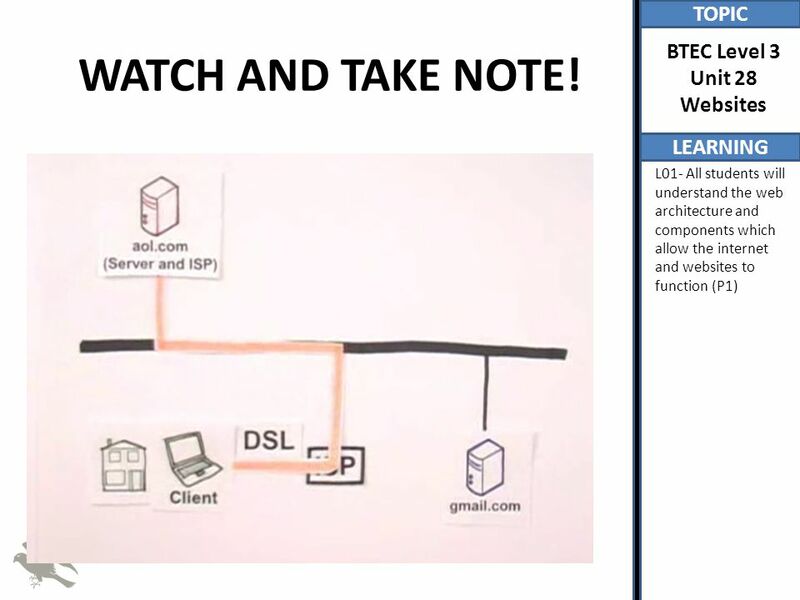 For D1, learners should give a technical explanation of application layer protocols in relation to the TCP/IP protocol. 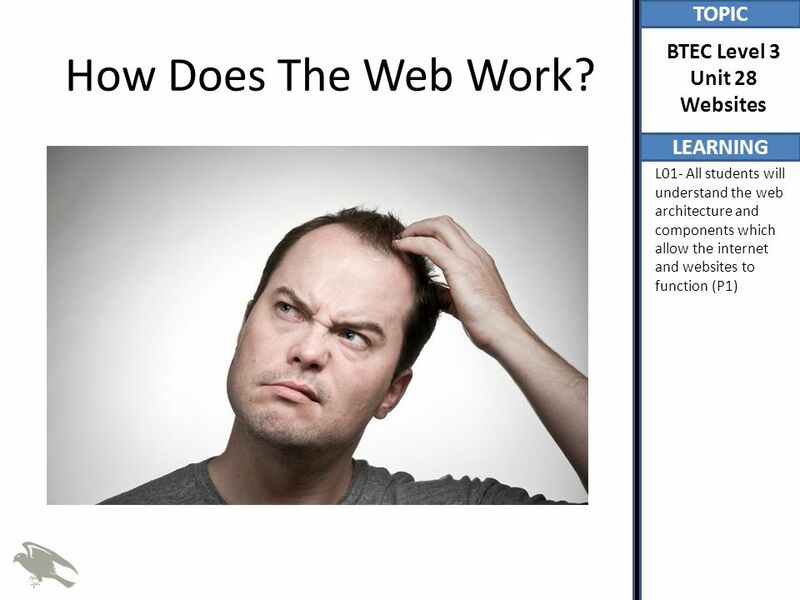 7 How Does The Web Work? 8 WATCH AND TAKE NOTE! 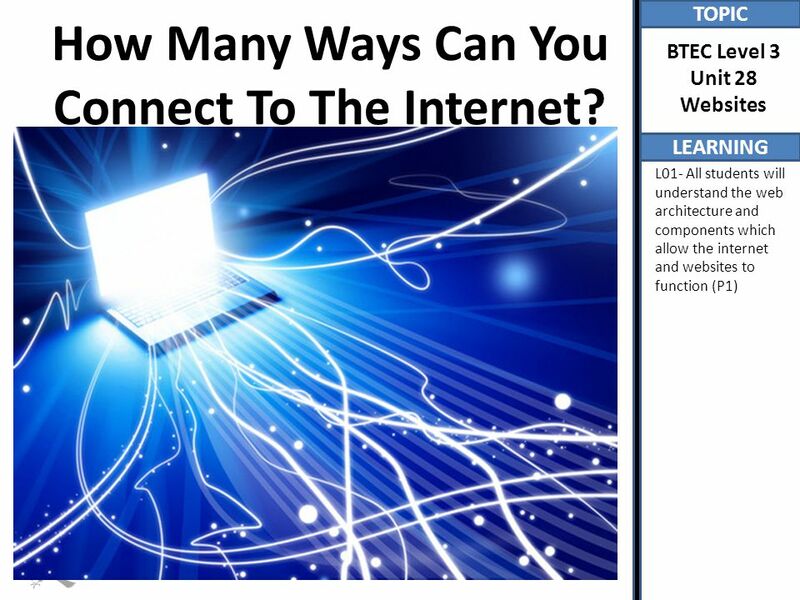 Download ppt "How Many Ways Can You Connect To The Internet?" Internet Hardware Connected ‘Servers’ Servers provide: – Web pages – – File downloads. 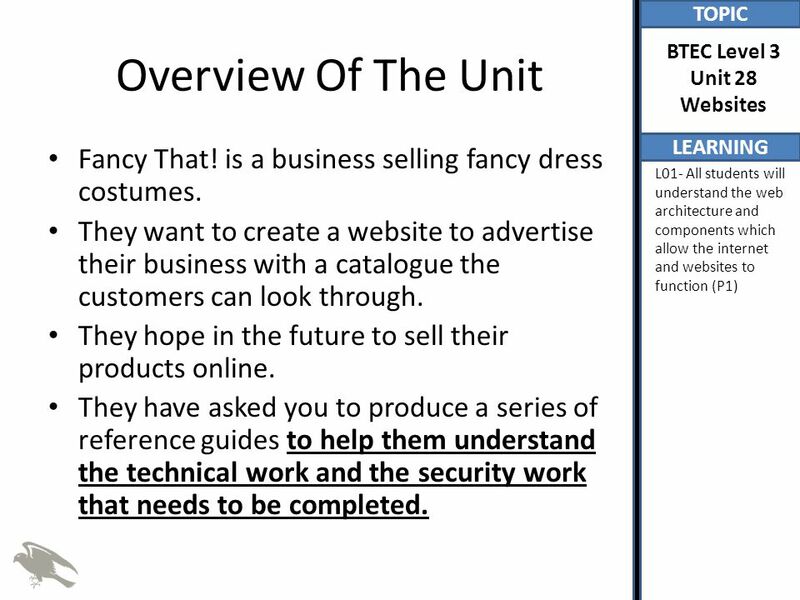 TOPIC LEARNING BTEC Level 3 Unit 28 Websites L01- Understand the customer requirements L02- Create a website design that meets the audience and purpose. 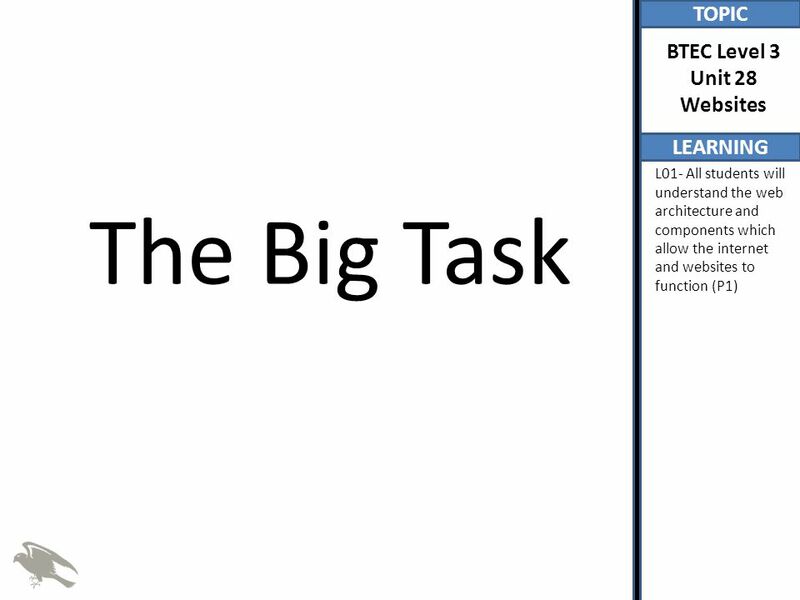 TOPIC LEARNING BTEC Level 3 Unit 28 Websites Understand the difference between server side and user side capabilities, Know a range of different user side. TOPIC LEARNING BTEC Level 3 Unit 30 Graphics HOMEWORK. 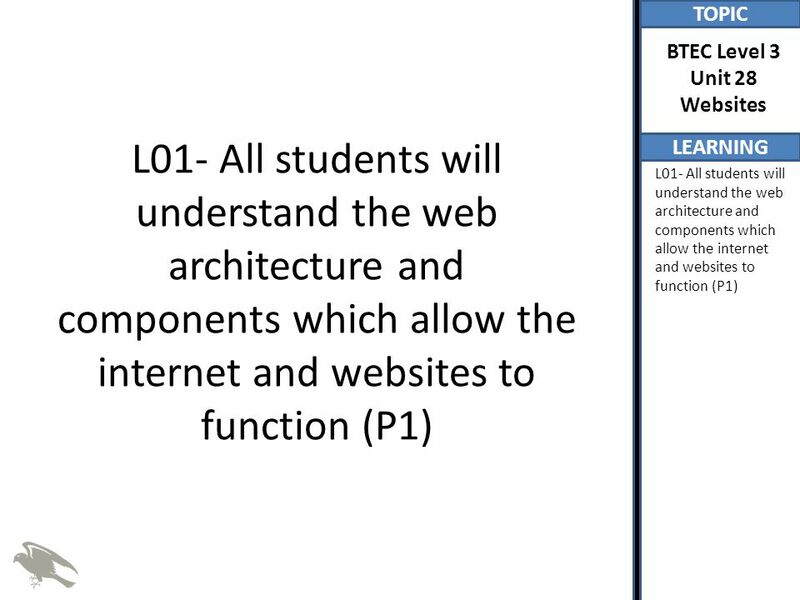 TOPIC LEARNING BTEC Level 3 Unit 28 Websites L01- All students will understand the web architecture and components which allow the internet and websites. Module 5: Configuring Access for Remote Clients and Networks. Skills: none Concepts: host, TCP/IP communication software, TCP/IP layers, TCP/IP functions, TCP/IP protocols This work is licensed under a Creative Commons. 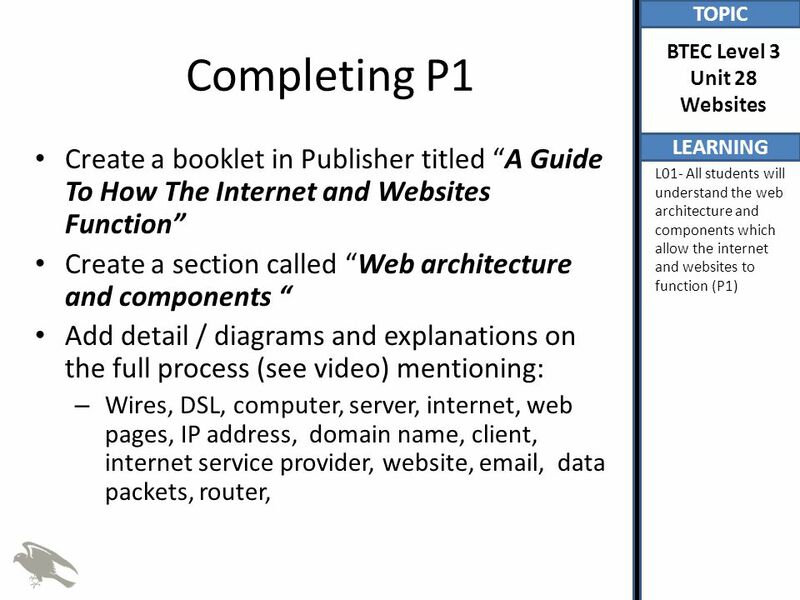 Skills: none Concepts: local area network, router, inter network, the TCP/IP layered software “stack”, layer functions, layer protocols, dumb versus smart. Skills: Concepts: layered protocols, transport layer functions, TCP and UDP protocols, isochronous applications This work is licensed under a Creative. TCP/IP: the transport layer Skills: none IT concepts: layered protocols, transport layer functions, TCP and UDP protocols, isochronous applications This. TCP/IP summary Skills: none IT concepts: review This work is licensed under a Creative Commons Attribution-Noncommercial- Share Alike 3.0 License. CLIENT / SERVER ARCHITECTURE AYRİS UYGUR & NİLÜFER ÇANGA. IT CONCEPTS An Online Course # IT Concepts covers the concepts and vocabulary needed to grasp the basics of information technology. The course. Vocabulary URL = uniform resource locator: web address protocol –set of rules that networked computers follow in order to share data and coordinate communications. 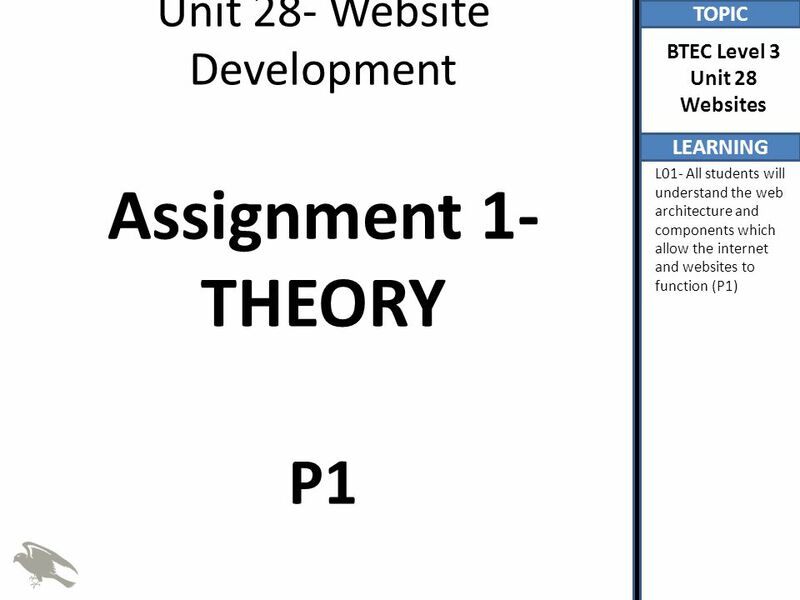 IT CONCEPTS An Online Course #605701 1 IT Concepts covers the concepts and vocabulary needed to grasp the basics of information technology. The course.